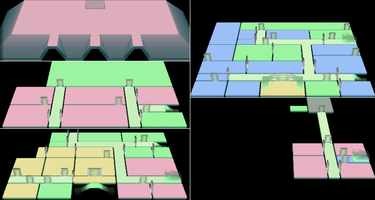 The Wardrobe Room is one of many rooms in Luigi's Mansion; it is in the first area. After clearing the Anteroom, the Wardrobe Room becomes accessible. Several Gold Ghosts first appear. After they are defeated, one Garbage Can Ghost appears. Another ghost is hiding in the closet; the lights turn back on once Luigi captures it. A Key appears on a nearby shelf once the light is turned on. This key allows Luigi access to the Study. During the blackout, Uncle Grimmly resides in the Wardrobe Room. Grimmly has taken the key to the Breaker Room and Luigi needs the key to restore the power. Sucking up Grimmly grants Luigi the Breaker Room key, which then enables Luigi to restore electricity to the mansion. 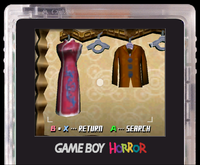 Some clothes found on the south wall, viewed through the Game Boy Horror. The Wardrobe Room is small and, as its name implies, has three wardrobes in it. It also has a shoe rack, a hat rack, and a mirror. There is also a Speedy Spirit hidden in the rightmost wardrobe. This page was last edited on September 14, 2018, at 11:05.